Ibu (Halmahera, Indonesia): (27 Apr) Volcanic Ash Advisory Center Darwin (VAAC) issued the following report: ERUPTION TO FL060 MOV N AT 26/2158Z. Sinabung (Sumatra, Indonesia): (27 Apr) Volcanic Ash Advisory Center Darwin (VAAC) issued the following report: ERUPTION TO FL130 MOV WSW AT 27/0033Z. Dukono (Halmahera): Volcanic Ash Advisory Center Darwin (VAAC) issued the following report: VA OBS TO FL060 EXT E AT 27/1700Z. Cleveland (Aleutian Islands, Alaska): (27 Apr) A new lava dome is growing in the summit crater of the volcano. Therefore, the Alaska Volcano Observatory (AVO) raised the Aviation Color Code to ORANGE and the Volcano Alert Level to WATCH. 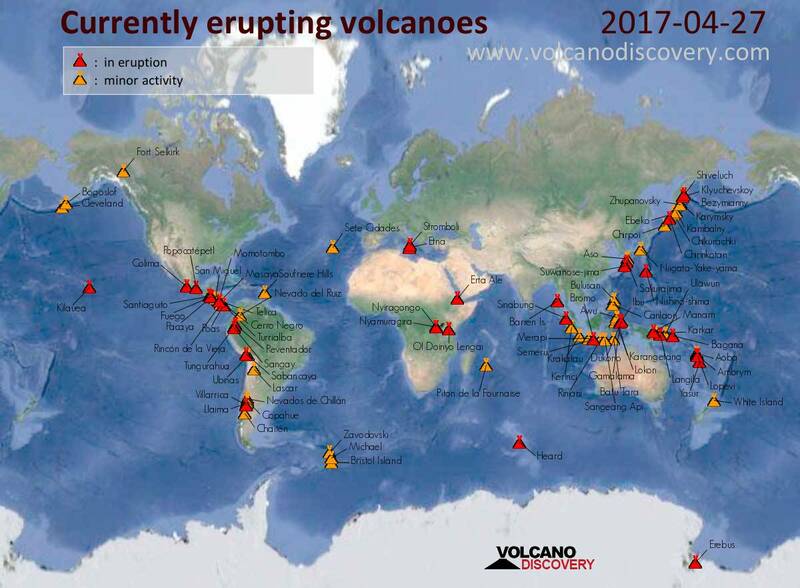 The dome was detected on recent satellite images and is thought to have started to grow after the end of the most recent series of explosions (which destroyed a previous dome) after 31 March this year. Slightly elevated surface temperatures could be detected on satellite data over the past weeks and the dome itself could be seen on satellite imagery on 15 April when it was a flat mound of lava about 10 m in diameter. On 23 April, its size had grown to approx. 45 m in diameter. AVO detected no seismic activity associated with the dome growth.